Save the date…but what date? Am I going to be Mrs. Feng? Wedding bells are chiming for the two main couples! Hold up, why are Shan Shan and Feng Teng so meh about their upcoming wedding? Is there a trouble in paradise or just a classic case of pre-wedding jitters? Per usual, no one knows for sure what Feng Teng is really thinking behind his cool demeanor. But at least one thing’s for sure, there’s no way that Shan Shan is going to turn into a Bridezilla. After Feng Teng tells Shan Shan that he doesn’t care that her pregnancy was a false alarm because he’s happy either way, he adds that she’s still young and he doesn’t want her to settle down to become a mother just yet. He tries to joke around that they still have more time to play around, but Shan Shan gets serious and asks him if he really thinks that she can get pregnant. Feng Teng tells her that she just needs to trust him and his ability to take care of her. I’ll take care of ya. He asks her how her eating habits have been lately, and wonders why she filled up her entire stomach with foods that messed up her blood levels to make the nurse think that she was pregnant. Shan Shan inadvertently reveals to him that she got the food from her coworker friend, Ah Jia, aka the same girl who gave her the contraband knives that got her arrested at the train station during Chinese New Year. She quickly tells him to not punish Ah Jia for anything, but Feng Teng tells her that he knows what he has to do. Better run, Ah Jia. Gotta go warn Ah Jia. But surprise! The “repayment” that Feng Teng gives to Ah Jia for causing so much trouble for Shan Shan is a promotion at work. Feng Teng tells Shan Shan that it was because of her contraband knives that forced Shan Shan to have to stay with Feng Teng during Chinese New Year, and allowed them to start dating. And then it was because of the sketchy foods she gave her that let them get engaged. Turns out that Ah Jia was Shan-Teng’s biggest matchmaker. Everyone’s getting promoted outta here. In the meantime, Feng Yue asks Feng Teng for his opinion on some details for the wedding, but he just tells her to pick whatever she wants. Well, that was easy! She tells him that she used to be really worried about him finding someone, but now she can breathe a sign of relief since he now not only found a girlfriend, but is getting married! But when she throws in that she can’t wait to have a little nephew, Feng Teng’s entire demeanor changes and tells her that he and Shan Shan aren’t planning to have kids anytime soon. Feng Yue asks if Shan Shan is still have difficulties with her health after the surgery. Feng Teng tries to end the discussion by telling her that she shouldn’t think that his marriage is only to carry on the family name. Still, Feng Yue insists that she’s his sister and he should discuss these things with her. She asks him outright if Shan Shan will be able to have kids, and Feng Teng tells her of course she can. Shan Shan comes home during Feng Teng and Feng Yue’s discussion, and Feng Teng quickly whispers to his sister that they aren’t going to talk about this anymore. Feng Yue pulls Shan Shan over to her pile of wedding books, and asks her to give some input on the wedding. Feng Teng interrupts them to say that if Shan Shan thinks that everything is happening too fast, they can push back the wedding. Shan Shan can’t help but wonder to herself if this is Feng Teng’s way of hinting to her that he doesn’t want to get married anymore. Wedding planning fun. Or not. The next day, when Shan Shan goes to Feng Teng’s office for lunch, his secretary mentions to her that he asked her to compile a list of all the company’s business partners and clients. She said that it’s weird that he wants this info when there aren’t any upcoming Windgroup functions or parties. This secretary is a regular Sherlock Holmes because she immediately concludes that perhaps Shan Shan and Feng Teng are getting married. Mad deductive skills, that one. Shan Shan vehemently denies it and tells her to stop being crazy. Shan Shan thinks to herself that the wedding must still be happening if Feng Teng is already planning the guest list for it. But when she later asks him when he wants to have the wedding, he says that she’ll need to ask Feng Yue about that, but they’re in no rush. Sigh. Shan Shan is trying on wedding dresses with Feng Yue and Li Shu, but she doesn’t seem excited about it at all. Instead, it’s Feng Yue and Li Shu who are the ones with all the opinions and deciding what changes to make to the dress. It seems like all Shan Shan is there to do is model the dress for them. When they tell her that she can go sit and rest if she’s tired, that’s the most excited Shan Shan’s looked all day. Li Shu decides that none of these dresses are special enough, and she’s going to have her and Shan Shan’s wedding dresses custom made by some famous designer instead. When they ask Shan Shan for her opinion, she’s already fast asleep on the chair. Feng Yue brings Shan Shan to a Chinese medicine clinic and tells her that she’s a regular here, and they will be able to take good care of Shan Shan before the wedding. Oh Feng Yue, we know where you’re going with this. She keeps saying to Shan Shan that she needs to take care of her body before the wedding, and advises her to come often to get her vitals checked and get prescriptions for Chinese meds. With those very Chinese meds in hand, Feng Yue and Shan Shan run into Feng Teng when they get back to the Feng mansion. 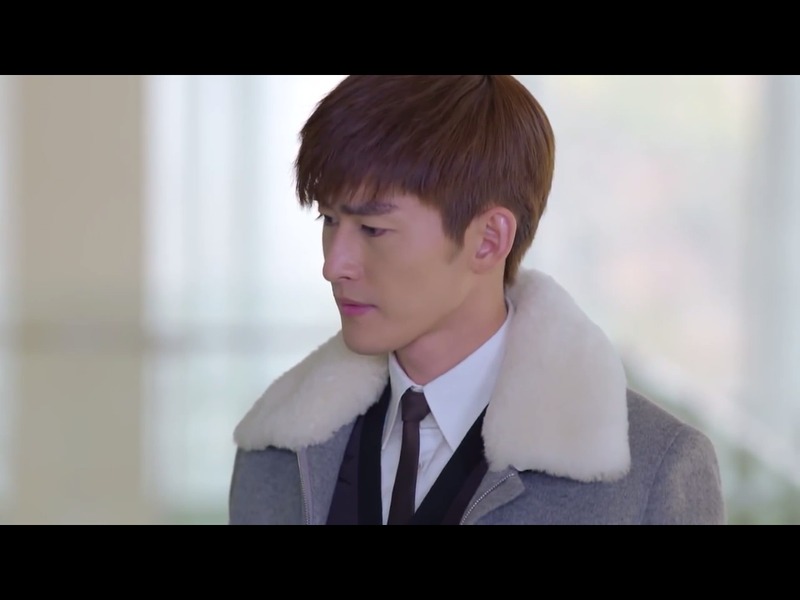 When he hears that Feng Yue took Shan Shan to the clinic and sees the meds, he immediately gets angry and tells Feng Yue that she’s being a busybody. The crew is at the Feng mansion to go over plans for the wedding, which basically means that Feng Yue and Li Shu are freaking out over the invite lists and seating arrangements. While they’re stressing over who’s going to sit next to whom, Shan Shan and Feng Teng are just straight-up chilling. Li Shu sees Zheng Qi’s ex-girlfriend’s name on the list and asks him why the hell it’s there. Zheng Qi tries to calm her down and says that he only included her because she’s dating one of his friends now, and he hasn’t even seen her in years. Li Shu ain’t having any of it though because she keeps insisting that this is HER wedding and she won’t allow that girl to be there. Zheng Qi tries to reason with her that there’s nothing to it, but Li Shu goes full Bridezilla on him and says that it’s her way or nothing. She storms off and of course Zheng Qi chases after her. After they leave the room, Shan Shan asks if they’re going to be okay and Feng Teng says not to worry about them. Shan Shan jokes to him that it’s a good thing that he isn’t Li Shu’s groom. Yeah, no kidding. She thinks to herself how Feng Yue and Li Shu are in the middle of all this wedding planning stress, but she and Feng Teng are so calm and worry-free about their wedding. You dodged a bullet, buddy. Li Shu has really taken on the Bridezilla persona quite well because when she’s out tasting wines for the wedding with Feng Yue and Zheng Qi, she finds out that the famous designer can’t make her wedding dress anymore. Cue freak out. While she’s yelling and whining about the dress situation, Zheng Qi is very calmly sipping on some wines. She asks him why he isn’t more worried about stuff like she is, and he says that they can divide up the work for the wedding, and he’ll be in charge of the wine. This went over with Li Shu about as well as you think. What did I do now?! Shan Shan thinks to herself that she doesn’t want to be fighting over wedding stuff like Li Shu and Zheng Qi, but it’s a little weird how calm and peaceful it is between her and Feng Teng. They definitely aren’t acting like a couple who’s about to get married. When she’s getting ready to drink her Chinese medicine, Feng Teng stops her and tells her that she doesn’t need to drink meds since there’s nothing wrong with her. She asks him if it’s because he doesn’t want to have kids so soon. He tells her that a couple needs to have some alone time together after getting married before they settle down to start a family. These ambiguous and vague answers that Feng Teng keeps giving Shan Shan is really making her overthink things. Shan Shan calls her mom not knowing if she should tell her about the upcoming wedding. Um, obviously! Isn’t it really weird that she’s about to get married and she’s only thinking about telling her parents now? When she does call, she asks her mom if she told her dad about her dating Feng Teng yet, and her mom tells her not yet, but she’ll tell him soon. Hearing that her dad doesn’t even know that she has a boyfriend, Shan Shan decides that she definitely can’t tell them now that she’s getting married. Don’t forget about that false alarm pregnancy…never mind, maybe don’t tell them about that. Zheng Qi and Li Shu are apparently continuously fighting with each other because of all the wedding stuff, and he goes to Feng Teng to vent about the stress that goes into marrying Li Shu. Feng Teng advises him to just apologize to her because she’s the type of person who will easily forgive. Zheng Qi complains that he’s already had to apologize to her about a million times. Feng Teng says, why not just apologize one more time then? Zheng Qi says that Feng Teng sure is lucky to have someone like Shan Shan who doesn’t complain about anything. He asks him if she complains or lectures him in private, but Feng Teng doesn’t answer him. Liu Liu runs into Feng Teng at Windgroup after having a meeting there with some people about their upcoming collaboration. They step away to talk in private, and Liu Liu reveals to him that Shan Shan has some reservations and concerns about their marriage. Even though he told he that he doesn’t care whether or not she was actually pregnant, Shan Shan still wonders if he’s only willing to marry her because he thought she was indeed pregnant. Later, Feng Teng thinks to himself about this and remembers how Shan Shan had asked him before why he’s acting so indifferent about the baby. Over at Zheng Qi’s house, Li Shu arrives to find an elaborate setup with candles spelling out, “Forgive Me,” on the table. Zheng Qi presents her with a bouquet of flowers and tells her that he knows that she is a perfectionist, but even she can’t do everything on her own. He tells her that he’s willing to be her support system from now on, and he’s willing to go with whatever she wants for the wedding. He even got the designer to agree to make Li Shu’s wedding dress again. No need to guess who wears the pants in this relationship. Enough Li Shu & Zheng Qi drama, okay? No one cares. When Shan Shan and Feng Teng get home, things are feeling kind of awkward and neither of them are really talking to each other. In fact, the minute they get home, Feng Teng goes over to stare out his window and to ponder away. After Shan Shan changes out of her work clothes, she goes over to Feng Teng in the living room. She says that she has a question for him. She asks him if he didn’t think she was pregnant, would he still want to marry her? Feng Teng replies that if he didn’t think that she was pregnant, he wouldn’t want to think about marriage so soon. After failing to tell her parents about her upcoming wedding to Feng Teng, Shan Shan asks him if she should bring him to visit her parents or bring them to Shanghai to meet him. He tells her that obviously they’ll go to her hometown to see her parents. When she asks when they should go, he says that it can wait until they figure out the exact wedding date…but it’s no rush. Mama Xue tries to bring up Feng Teng to Papa Xue, but he is still not totally happy to hear that Shan Shan is with some fancy rich guy. He tells her to call Shan Shan to bring her boyfriend to see him, but they decide that it’s better to wait and let Shan Shan decide for myself when to bring him to meet them. So, never? Not planning a wedding is tiring.